Junior linebacker Justin Mikeworth and redshirt freshman linebacker Reed McBroom tackle Southwest Baptist running back Larry Nixon. Nixon and SBU quarterback TJ Edwards combined to run for 195 yards against the Bulldogs defense. 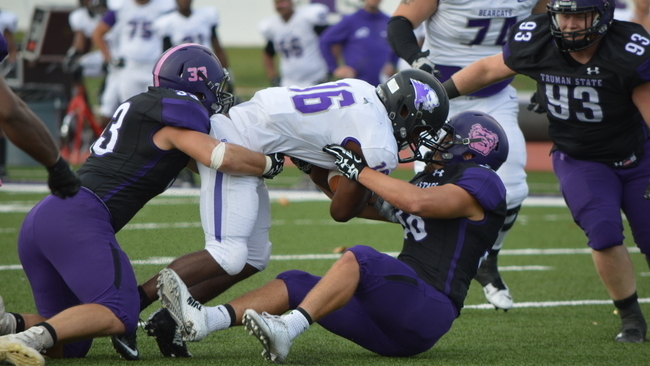 For the first time since 2005, the Truman State University football team fell to Southwest Baptist University Saturday. The ‘Dogs are 1-5 for the year and still winless in GLVC conference play. What was thought to be a highly-anticipated season for the Bulldogs is instead coming up short. Last year, the two teams ended their winning seasons as co-conference champions. Prior to the start of season, SBU was ranked first and Truman ranked second in conference standings. The University of Indianapolis is now a top 5 team, leading the conference by two games. Head coach Gregg Nesbitt said his job as a leader is to find the positives in these situations and things that need to be improved upon, but he said at this point, he and the players are tired of trying to find the silver lining. Nesbitt said there is no sugar coating it anymore — the bottom line is the team ended up a play short last Saturday. Even though the season is not going as expected, Nesbitt said he still has faith in the work ethic of his team and coaching staff. He said he and his staff are still focused on the season at hand, and hope to find some wins for the rest of the season. As one of many Bulldogs injured in the first half of the season, Drew Slager, redshirt sophomore wide receiver, started the year injured and is now coming into his own with a career-high seven caught passes and 102 yards, including a 40-yard reception last weekend. Slager said he thought missing multiple weeks of practice and games set him back in terms of confidence. He said despite the loss, last weekend was a huge positive for him because it allowed him to get back in the rhythm of the offense. Slager said it was a moral-booster for his confidence, as he said he hopes to propel this forward to the homecoming matchup against top 5 team Grand Valley State University. After the crushed expectations of the first six games, Slager said he doesn’t think he’s the only one getting back in the swing of things. He said he thinks, as a whole, the offense is gaining more confidence and making more impressive plays each week. He said a good week of practice can help the team carry an optimistic attitude into Saturday. Despite losing 41-3 to Grand Valley last year, Slager said he is excited to play them once again. He said he thinks the homecoming atmosphere in Stokes Stadium on Saturday will be the extra push the ‘Dogs need when taking on such an elite team. The non-conference matchup will begin at 2 p.m. Saturday Oct.14 at Stokes Stadium as Truman celebrates Homecoming weekend.